Your dog is eagerly awaiting a new home with you. We want to make the transition as smooth as possible for both of you. Toward that end we offer the following suggestions. Bring the dog home when your household is relatively quiet. Avoid holidays, birthdays, etc. Plan to spend a few days around the house adjusting to one another. Secure and safety check your home. Read and reread the article at the end of this section on "How not to become a Member of the Runaway's Club." 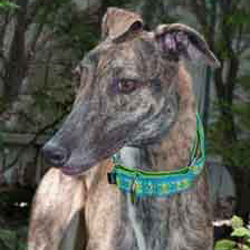 Remember that a greyhound can reach 45 mph in three steps. This cannot be emphasized enough. One slip on your part can mean death for your dog. Don't take chances. Apart from getting out, your dog faces many other dangers around your home. Household chemicals and some house and garden plants are poison to dogs. It can drown in swimming pools and get cut on sharp corners. Inspect your home as you would before bringing in a toddler. 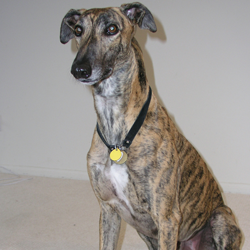 Note that the Martingale (or Premier) collar that came with your dog works similar to a choke chain. Never put tags on the loop intended for the leash. They can get caught and strangle the dog. Put the tags on the square loops on the side. Greyhounds love soft sleeping areas. Consider placing a second bed near where you spend time during the day or evening, ex: family room, home office, etc. Decide where you want your dog to eat its meals. 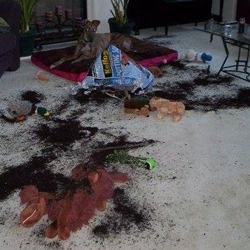 Greyhounds can be messy eaters, so place the food dish somewhere that is easy to clean up. Remember to keep fresh drinking water available at all times, even when you are gone. Determine who will be responsible for feeding, exercising, and training the dog. Decide what penalties will be appropriate for neglecting these duties. Remember, penalize the person who failed, not the dog. This will be work—long term work—so plan ahead. Prepare yourself mentally for a time of adjustment. There will be ups and downs at first. You must earn your dog’s trust by being patient and gentle. 1. Allow at least a weekend for the initial adjustment. If you work outside the home during the week, take your greyhound home on Friday night if possible. 2. Introduce the new "pack" carefully. Your greyhound will see your family as his new pack. Help him adjust by keeping the first meeting as non-stressful as possible. Don't bring him home if you are hosting a party that weekend. Let him meet each person or animal one at a time. 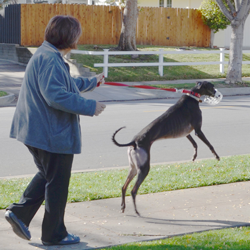 Since dogs can be very territorial about their homes and yards, introduce your current dog(s) to your greyhound in the front yard or in some other spot that your dog won't think is his or her territory. It may seem unnecessary to you, but this only takes a few minutes. 3. Keep a close eye on things. Don't let your greyhound out of your sight for a while. 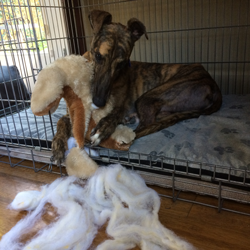 You want to make sure that no inappropriate interaction takes place between your child (such as running after a scared greyhound) and the dog, or between your animals (such as rambunctuous play that could become aggression before pack relationships are worked out). Read more about pack relationships. The most significant adjustment will take place in the first week. 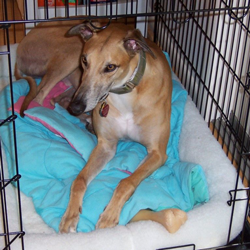 Because your GreySave greyhound has been living in a home for at least several weeks before you adopt him, he has learned a lot about life in a home. Now he has to transfer that knowledge to your home. He will do so faster because of his foster home experience, but he will still need some time to adjust--especially to elements of your home that differ from the foster home. BE PATIENT. Don’t expect everything to go smoothly right away. The dog will probably soil in the house and may destroy something. He or she will take a lot of your time, and your daily routine will change, especially at first. The two of you may not immediately bond. Patience is the key–like all relationships, this will take time. Be consistent with training and try to keep a regular schedule. Dogs need routine and consistency. Even slight variations in the early days confuse the dog. Meals and bedtime should be at set times and rules should be consistently enforced. Play with the dog, but also give it time to rest. Insist that it gets some quiet time alone. Over stimulation can cause a dog to become hyperactive. Prepare for possible separation anxiety. 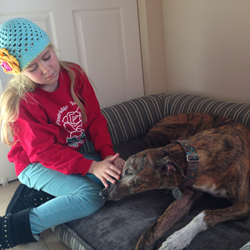 Greyhounds quickly form strong bonds with their humans. 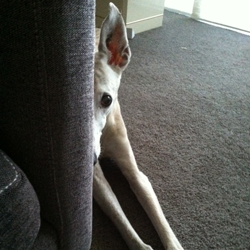 The old saying in greyhound circles is that you'll never go to the bathroom alone again. 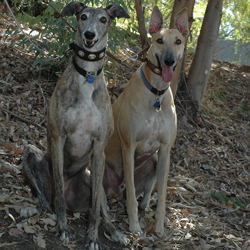 In some greyhounds this can lead to separation anxiety, meaning that the dog becomes anxious and stressed out when he is left. He may bark or become destructive. Separation anxiety can be prevented or corrected. Read about understanding and correcting separation anxiety. All canines, and that includes your dog, have a natural pack instinct. This is one reason dogs fit so well into families. However, remember the pack needs a leader; if you do not fill that role, your dog will be glad to take over. Packs are not democracies. You—not your dog—must be the established leader. Understanding this social structure can be valuable in understanding and training your dog. Many books on the subject are available at your local pet or book store. Never allow mounting, growling, or nipping at you or any human member of your family. These are ways the dog tries to show dominance over you.